Ada pertanyaan untuk Hotel Excellency? Hotel Excellency, terletak di Zona Kereta Api Bhubaneswar adalah pilihan yang populer bagi para wisatawan. Hotel ini terletak 02.00 Km dari pusat kota dan menyediakan kemudahan akses ke fasilitas-fasilitas penting kota ini. Yang tidak ketinggalan adalah akses mudah dari hotel ini ke sejumlah obyek wisata dan landmark kota ini seperti Swosti Travels, State Museum, Ram Mandir| Bhubaneswar. Gunakan kesempatan untuk menikmati pelayanan dan fasilitas yang tidak tertandingi di hotel Bhubaneswar ini. Fasilitas terbaik hotel ini termasuk layanan kamar 24 jam, Wi-fi di tempat umum, parkir valet, tempat parkir mobil, layanan kamar. Para tamu dapat memilih dari 80 kamar yang semuanya dilengkapi dengan suasana yang tenang dan harmonis. Hotel ini menawarkan berbagai pengalaman hiburan unik seperti pusat kebugaran, kolam renang luar ruangan, taman. Ketika Anda mencari penginapan yang nyaman di Bhubaneswar, jadikanlah Hotel Excellency rumah Anda ketika Anda berlibur. The best part of this hotel is its location which is just next to Bhubaneswar Rail station. I purposely chose this hotel as I had to take a train to Sambalpur in the early morning and I'm glad I made that choice. The food at the restaurant were exceptionally good too. Room was just OK. Restaurant was also OK, but they do not understand that we, western people, do not like spicy food. Reception was slow and burocràtic. The manager helped us to get bicycles and a ride from airport as well complementary ride to trainstation. We also got wifi complementary. We had a great Time. but WiFi facilities only for 12 hour in 24 hour. And every time new password is needed and it is cumbersome. All are good, except the wifi quality. The password is changed every 12 hourly.which is not convenient. When I arrived the receptionist was very ubrupt and made me feel very unwelcome. Had I not pre paid for my stay I would have walked out then. The swimming pool is on the roof top with no shading or places to sit by the pool and is I'mpossible to swim as the heat really hits your head. Apart from the receptionist the other staff in the hotel were polite and courteous. We had a great time at the hotel and the tour arrangements were fantastic. The staff were good. Buffet spread was excellent. This hotel advertises with 4 starts, but I would hardly give them 2. The only great thing is the hotel lobby area - its looks so georgeous and noble, that at the beginning you are really impressed. Old fashion furnitures in colonial style and marmor stairs at the enter - it really looks like a good 4-stars hotel. Until you have checked in. Than you slowly realise more and more, that bad management turned this hotel to a really poor place 1. The charge WiFi in rooms with 120 rupies for 1 hour! EVERY hotel in 4-stars kategory proposes room - WiFi free of charge! 2. The air-conditioners are soooo BAD mountained, its unbeleivable! In my first room the air conditioner, which was set on maximum power, gave not a better cooling as the fan on the celling! After I protested, they proposed me another 2 rooms, in the first one the air conditioner was same bad. In the second it was still weak, but at least you could feel some cooling. I can only explainn this with the fac t, that they dont clean air conditioner devices inside or that the air conditioners have not been maintened for a looong time! 3. They charge taxi to the airport with 400 rupies, and this is for a distance of 3 km (2 miles)! On the day before I paid 1000 ripies for an aircon taxi from Puri to Bhubaneswar, where the distance between is more than 100 km! I was happy, that I have booked this hotel only for 1 day staying. I do not recommend this hotel to any body and will not stay there again. we stayied one night only . near bus and train stations. A good hotel, very close to the railway station. The room was large and comfortable and the staff were helpful and pleasant. Breakfast was very good with a good selection of Indian food, cereals and fruits. We used the hotel as a base to explore the city as well as take trips to the nearby caves and to Puri. i was on a short trip and stayed at this hotel for two days along with a client of mine. the hotel was just being set up as it was new and parts of it were not fully functional. 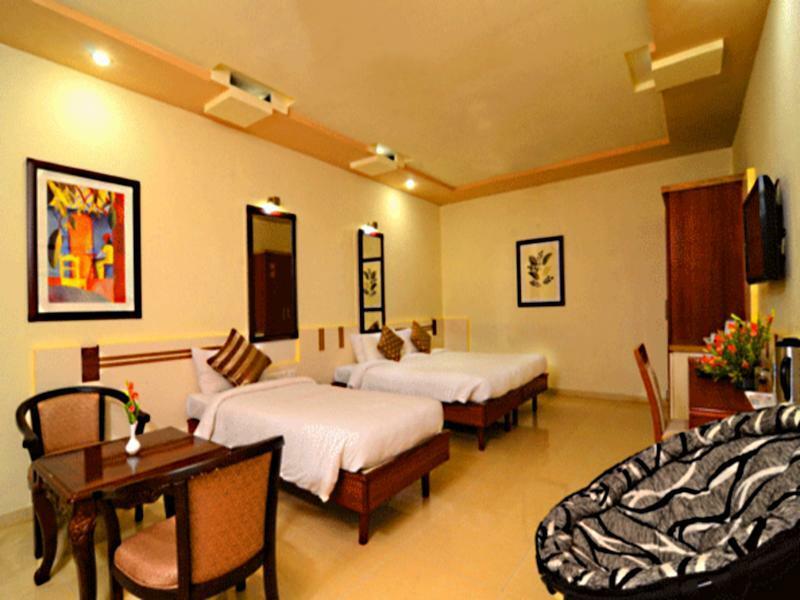 the rooms were very comfortable and the staff were courteous. the breakfast was not much and could be improved for the standard put up by the hotel. i will surely return back for a stay during my next visit to bhubaneswar.